A GREAT READ FOR YOUNG PEOPLE INTERESTED IN MARINE LIFE AND IT’S CONSERVATION! 2 full-colour Illustrated stories about Web the Green turtle on the GREAT BARRIER REEF for THE PRICE OF ONE! A TALE OF TWO TURTLES is et in the South Pacific Ocean on Australia’s Great Barrier Reef; follow the thrilling story of Wave, a young female green turtle, from her birth on a warm tropical night through her perilous adventures with boyfriend, Web. Together they face many natural and man-made hazards including sharks, storms and pollution until Wave is ready to return to the same beach to lay her eggs and start a new cycle of life. Then explore the South Pacific ocean life a little further when Wave and Web meet Davo, a juvenile humpback whale, who tells them of his first annual migrations and the dangers he and his kind face from whalers. Read about his migration path and also about those who try and prevent the whaling and the dangers they face. 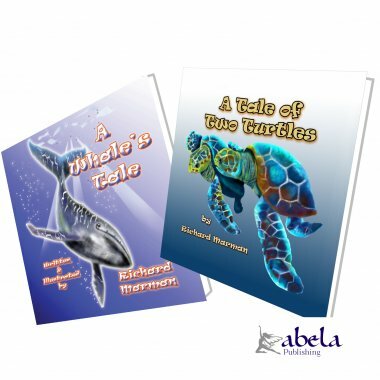 Not only are these books educational, teaching young people about the full life cycle of turtles, whales and other aquatic life, but each page is beautifully illustrated with exquisite attention to detail and a text to delight and amuse children and adults alike. 10% of the net sale from the sale of two books will be donated to the Greenpeace. OOLAH the lizard was tired of lying in the sun, doing nothing. So he said, “I will go and play.” He took his boomerangs out, and began to practise throwing them. While he was doing so a Galah came up, and stood near, watching the boomerangs come flying back, for the kind of boomerangs Oolah was throwing were the bubberahs. They are smaller than others, and more curved, and when they are properly thrown they return to the thrower, which other boomerangs do not. So to this day, underneath the Galah’s crest you can always find the bald patch which the bubberah of Oolah first made. 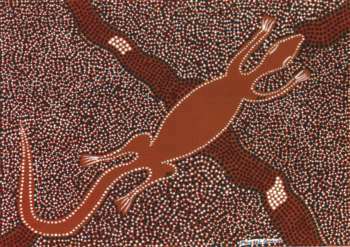 And in the country of the Galahs are lizards coloured reddish brown, and covered with spikes like bindeah prickles. OLD BYAMEE said to his two young wives, Birrahgnooloo and Cunnunbeillee, “I have stuck a white feather between the hind legs of a bee, and am going to let it go and then follow it to its nest, that I may get honey. While I go for the honey, go you two out and get frogs and yams, then meet me at Coorigel Spring, where we will camp, for sweet and clear is the water there.” The wives, taking their goolays and yam sticks, went out as he told them. Having gone far, and dug out many yams and frogs, they were tired when they reached Coorigel, and, seeing the cool, fresh water, they longed to bathe. But first they built a bough shade, and there left their goolays holding their food, and the yams and frogs they had found. When their camp was ready for the coming of Byamee, who having wooed his wives with a nullah-nullah, kept them obedient by fear of the same weapon, then went the girls to the spring to bathe. Gladly they plunged in, having first divested themselves of their goomillahs, which they were still young enough to wear, and which they left on the ground near the spring. Scarcely were they enjoying the cool rest the water gave their hot, tired limbs, when they were seized and swallowed by two kurreahs. Having swallowed the girls, the kurreahs dived into an opening in the side of the spring, which was the entrance to an underground watercourse leading to the Narran River. Through this passage they went, taking all the water from the spring with them into the Narran, whose course they also dried as they went along. Meantime Byamee, unwitting the fate of his wives, was honey hunting. He had followed the bee with the white feather on it for some distance; then the bee flew on to some budtha flowers, and would move no further. Byamee said, “Something has happened, or the bee would not stay here and refuse to be moved on towards its nest. I must go to Coorigel Spring and see if my wives are safe. Something terrible has surely happened.” And Byamee turned in haste towards the spring. When he reached there he.saw the bough shed his wives had made, he saw the yams they had dug from the ground, and he saw the frogs, but Birrahgnooloo and Cunnunbeillee he saw not. He called aloud for them. But no answer. He went towards the spring; on the edge of it he saw the goomillahs of his wives. He looked into the spring and, seeing it dry, he said, “It is the work of the kurreahs; they have opened the underground passage and gone with my wives to the river, and opening the passage has dried the spring. Well do I know where the passage joins the Narran, and there will I swiftly go.” Arming himself with spears and woggarahs he started in pursuit. He soon reached the deep hole where the underground channel of the Coorigel joined the Narran. There he saw what he had never seen before, namely, this deep hole dry. And he said: “They have emptied the holes as they went along, taking the water with them. But well know I the deep holes of the river. I will not follow the bend, thus trebling the distance I have to go, but I will cut across from big hole to big hole, and by so doing I may yet get ahead of the kurreahs.” On swiftly sped Byamee, making short cuts from big hole to big hole, and his track is still marked by the morilla ridges that stretch down the Narran, pointing in towards the deep holes. Every hole as he came to it he found dry, until at last he reached the end of the Narran; the hole there was still quite wet and muddy, then he knew he was near his enemies, and soon he saw them. He managed to get, unseen, a little way ahead of the kurreahs. He hid himself behind a big dheal tree. As the kurreahs came near they separated, one turning to go in another direction. Quickly Byamee hurled one spear after another, wounding both kurreahs, who writhed with pain and lashed their tails furiously, making great hollows in the ground, which the water they had brought with them quickly filled. Thinking they might again escape him, Byamee drove them from the water with his spears, and then, at close quarters, he killed them with his woggarahs. And ever afterwards at flood time, the Narran flowed into this hollow which the kurreahs in their writhings had made. “Soon will the black swans find their way here, the pelicans and the ducks; where there was dry land and stones in the past, in the future there will be water and water-fowl, from henceforth; when the Narran runs it will run into this hole, and by the spreading of its waters will a big lake be made.” And what Byamee said has come to pass, as the Narran Lake shows, with its large sheet of water, spreading for miles, the home of thousands of wild fowl.